Is AdderRx Review Good, Not Great for you? 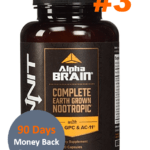 NexGen BioLabs, creator of AdderRx, is a supplement company born in 2012 that focuses on creating “premier nutraceuticals” through dedicated scientific-based research. As we visited the product’s official website, we quickly noticed its claims presented in check-box form. 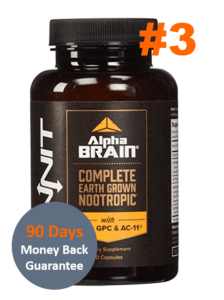 Adder RX promises to do 6 things: enhance mental energy and clarity, support cognition, support brain function, enhance mental focus, enhance alertness and concentration, and support mental endurance. We hope that AdderRx can provide what users are looking for – which is that mental edge to differentiate them from the rest of the crowd, whether it be excelling at a conference meeting and coming up with great business ideas or performing outstandingly well at school. 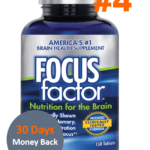 Since the creators have been very clever with wordplay (*ahem* AdderRx comes from the famous ADD drug, Adderall), we hope that they’ve made an equally bright decision with their formulation. Although the website does not offer full disclosure of the ingredients, we were able to get the formula listing off the bottle label. Each AdderRx capsule contains a 770 mg proprietary blend of SynephrineHCL,N-Dimethyl-4-hydroxyphenylethylamine,DMAE, 1,3,7 Trimethylxanthine, L-Theanine, Cytidine 5-Diphosphocholine, Schizandrol A, and Vinpocetine. After looking at the ingredients list we unfortunately have both bad and good news. So which one should we start with?…. Let’s get the bad news over and done with, shall we? 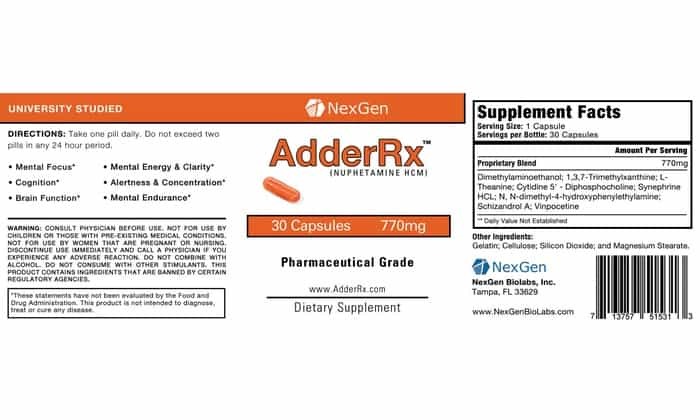 AdderRx’ formula includes DMAE – a substance that has been banned in the U.S., Canada and Australia because it has been shown to cause brain cell death when used for extended periods of time. Major red flag here, especially for those with legal concerns. Other than that minor hiccup, we must admit that the rest of the formula seems quite good. 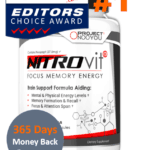 Vinpocetine, one of our favorites, works by increasing blood flow to the brain, thereby enhancing focus and concentration. L-Theanine, on the other hand, has relaxing properties and can help to calm your nerves and reduce anxiety. 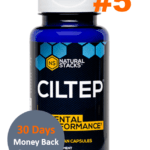 Meanwhile, N-Dimethyl-4-hydroxyphenylethylamine (don’t worry, we have a hard time pronouncing it too) works by inhibiting norepinephrine reuptake (an adrenaline hormone), thus increasing both physical and mental alertness. Oh and before you take the time to look up what 1,3,7 Trimethylxanthine is, we’ll save you the trouble by telling you that it’s a fancy name for caffeine. Caffeine is actually a very effective nootropic and can instantly help to clear up brain fog, increase mental alertness and reduce fatigue. 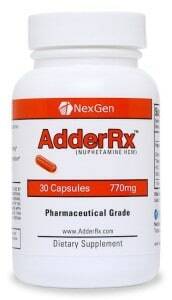 Each bottle of AdderRx contains 30 capsules and costs $39.99. You can purchase the product online via NexGen BioLabs’ official website. 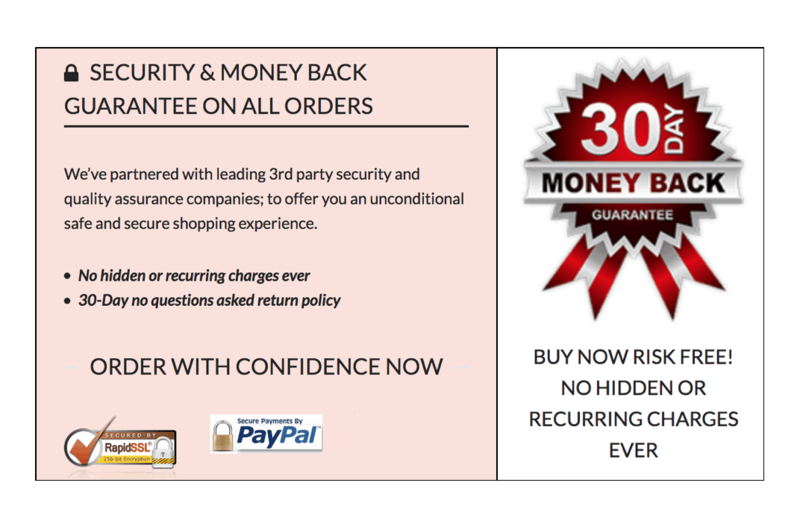 Moreover, the company behind AdderRx claims to offer a 30-Day-Money-Back-Guarantee. 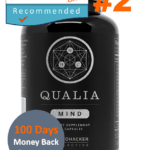 They recommend that you take 1 capsule a day (they emphasize that you should not take more than 1 capsule within 24 hours), meaning that the bottle will last you an entire month. 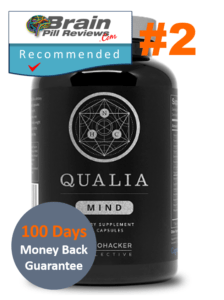 The product’s formula is good – there’s a quite a handful of esteemed nootropics packed in there such as Vinpocetine, caffeine, and N-Dimethyl-4-hydroxyphenylethylamine. However, if you do have legal concerns then please note that DMAE (a banned substance) is part of the formula. 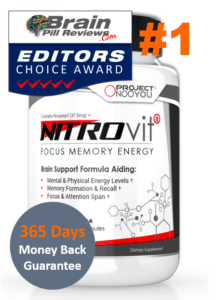 If you’re not sold by this product then feel free to checkout our editors’ top pick!